There are several specific landmarks in the world, which for some obvious reason attracts loads of travellers. Apart from man-made sights, like famous bridges, one type of those natural landmarks are waterfalls. The higher, the wider, or the more powerful the waterfall, the more it attracts travellers from around the world. Below is a selection of the most impressive waterfalls in the world. Although these waterfalls are among the most visited, that is not to say that some of the highest and largest waterfalls are less known to travellers. The largest (that is in terms of volume) waterfalls are found in Congo, while the 10th largest falls, the Niagara Falls, are arguably the most famous waterfalls. There are several waterfalls that are almost as high as the Angel Falls, but the latter one stands out because of its single drop. For example, the 2nd largest, the Tugela Falls in KwaZulu Natal in South Africa, is just 30 metres lower, but its single drop is only half of the Angel Falls. For more information on many waterfalls check the World Waterfalls statistics. At a height of over 100 metres and a width of about 1,700 metres, the Victoria Falls are the largest sheet of water falling in the world. Located within the boundaries of Mosi-oa-Tunya NP in Zambia and Victoria Falls NP in Zimbabwe, the falls are one of the most impressive landmarks of Africa and travellers from around the world are highly attracted by the opportunities near the falls. Hiking, wildlife viewing, bungee jumping, cruising, whit water rafting the Zambezi river and a helicopter ride to have a bird's eye view of the falls, all are very popular. As the falls are mainly located in Zambia, the best panoramic view is from Zimbabwe, viewing the falls head on. Even better would be the view from the air. The Murchison Falls, also known as Kabarega Falls are located in the north of Uganda. It breaks the Victoria Nile and squeezes a lot of water in a narrow 7 metres wide gap and 43 metres down. It's between Lake Victoria and Lake Albert. The falls are in the Murchison Falls National Park which apart from this impressive natural phenomena has a wide range of wildlife to explore, among which loads of crocodiles and hippos in the water of the Nile river. The Ouzoud Falls are located about 150 kilometres from Marrakech in the south central parts of Morocco, in the High Atlas mountains. 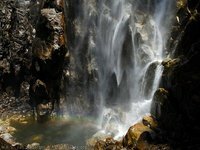 It is one of the best known natural features in this area and is a popular day trip from Marrakech. It is a surprisingly wet and green area in a mostly arid and rocky mountainous area. There are several mills located on the summit of the falls and even monkeys can be spotted in the green parts surrounding the falls. The bottom of the falls is accessible through a shaded path of olive trees. Located on the Jökulsá á Fjöllum river near Lake Myvatn in the northeast of the country, the Dettifoss waterfall is the most powerful waterfall in Europe. The falls are about 100 metres wide and over 40 metres high. Visiting this waterfall requires some skill in driving a 4x4 car. Gulfoss is one of the biggest waterfalls in Europe and is a popular sight located within a few hours drive of the capital Reykjavik. 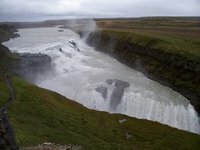 Together with Þingvellir and the geysers of Haukadalur Gullfoss forms the Golden Circle, popular with daytrippers. (translated Gulfoss, means Golden falls). The tarred roads end at Gulfoss, from where you can travel inland along the rough roads. The Hvítá river supplies the water falling into the canyon beneath. This is done in two stages with a total drop of 32 metres. Most of the water comes from melting water from glaciers, the rest is rainwater. The Rhine Falls, near the town of Schaffhausen in Switzerland are among the most impressive plain falls in the world. Not being very high (23 metres) they still are a major sight for travellers to the country and their width is very impressive: almost 150 metres. 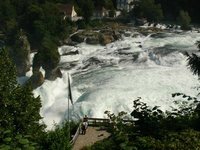 On both sides of the Rhine Falls there are viewing platforms, which can only be reached by climbing some steep steps. One can also get a view from the river, by getting on a boat making trips to the falls, which leave from Schloss Laufen, and Schlössli Wörth. The Niagara Falls are one of the most impressive waterfalls in the world. And although the Canadian side has been developed into a big tourist attraction, the falls haven't lost any of their appeal. The falls consist of the Horseshoe Falls on the Canadian side, which are almost 800 metres wide and have a direct vertical drop of over 50 metres, and the American Falls, which are about 320 metres wide and just over 20 metres tall. The small Bridal Veils are on the American side as well, separated from the American Falls with a single drop of almost 20 metres as well. The total drop of these falls is over 50 metres. The Canadian and American side are separated by Goat Island. One of the best ways to experience the impact of the falls is to take a boat ride on the Maid of the Mist, which brings you very close and you can view the falls from beneath. If you would rather walk, the Cave of the Winds takes you to the base of the Bridal Veils Falls. Where: Havasu Canyon is a side canyon of the Grand Canyon and located on the Havasupai Indian Reservation. Claim to fame: the largest series of water falls feeding into the Grand Canyon. Height: Navajo falls is 21 metres, Havasu Falls is 37 metres, Mooney Falls is 64 metres and Beaver Falls is 10 metres. Although not well known across the entire world anyone who has seen the Havasu Canyon falls will agree they are some of the most beautiful falls in the world. The stunning turquoise water snakes down the narrow canyon with waterless desert on both sides. To reach the falls there is only two ways. First is to take a raft down the Grand Canyon and climb up from the Colorado river. The other way is to hike into the Havasupai Indian Reservation to the town of Supai, which has no roads to it. After that hike down to the falls and camp in the camp ground. Visiting the falls is very difficult and requires a fair amount of preparation, including a permit arranged a few months in advance. For those too out of shape to hike in and out with all their gear, there are horses and donkeys that can be hired to transport people or belongings. For people looking for off the beaten track beauty this place is hard to beat. The Bridalveil Falls, together with the Yosemite Falls, are located in Yosemite National Park in California. The Bridalveil falls are almost 200 metres high and are one of the most characteristic sights in the park. The Yosemite Falls are one of the highest waterfalls in the world with a total drop of over 700 metres and a single drop of over 400 metres! 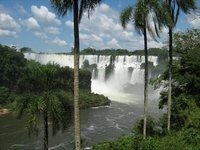 The Iguazu Falls are the biggest (but not the tallest!) waterfalls in South America and together with the Victoria Falls and Niagara Falls are one of the best known in the world. The waterfalls are located within the boundaries of the Iguazu NP in Argentina and Iguaçu NP in Brazil, together forming a UNESCO World Heritage site. The total width is about 2.700 metres and some of the falls are over 80 metres high. 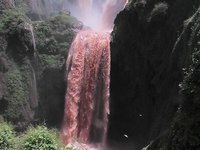 The most impressive single falls are the Garganta del Diablo: the Devil's Throat. 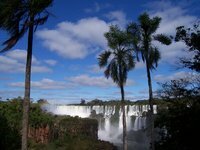 Although Brazil may have the best panoramic view, you can get much closer to the falls on the Argentinian side. There are several walkways, one of which brings you very close to the Garganta del Diablo. Be prepared to get wet, so pack your camera! With 979 metres, the Angel Falls are the highest free-falling waterfall in the world. It has a single drop of 807 metres. The falls are located in the Gran Sabana in Bolivar State in central-southern Venezuela and within the boundaries of Canaima National Park. Although the falls probably were viewed before, the discovery to the outside world was on the 16th of November 1933 when Jimmie Angel (after who the falls are named) flew over in his plane. Nowadays you have to take a plane from Caracas or Ciudad Bolivar to the Canaima Camp from where you can do river trips to the base. There are options to view the falls from the air as well. The Kaieteur Falls are amongst the most scenic and highest waterfalls in the world. 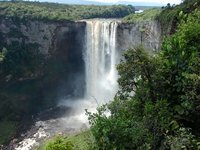 The falls are located in the Kaieteur National Park in the centre of Guyana's rainforest on the Potaro river. The total hight is about 250 metres, but the main fall is slightly less with 226 metres. It is over 100 metres wide and together with the location in untouched rainforest makes it one of the most spectacular to visit. It is not very easy to visit the falls and either time consuming or expensive. Flights are possible but more rewarding is a trek to the base of the falls. Australia has numerous amazing waterfalls, but Jim Jim Falls take the prize with a beautiful single plunge of 200 metres set amongst stunning red cliffs. You will need to time your visit to see these falls at their best. Wet season is when the falls are at their most spectacular, but access is also hardest, basically 4wd only. During the dry season, access is ok, but the falls can dry to a trickle. Even so, the view of the canyons is well worth the trip. For those with a bit of cash to spend though, the easiest, most impressive option is to do a scenic flight over the falls during the wet season. Sutherland Falls, on New Zealand's South Island are a mighty sight to behold with water dropping in three cascades with a total drop of 580 metres. Reaching the Sutherland Falls requires a 90-minute return walk off the Milford Track. This is version 53. Last edited at 1:04 on May 27, 17 by hasbeen. 13 articles link to this page.